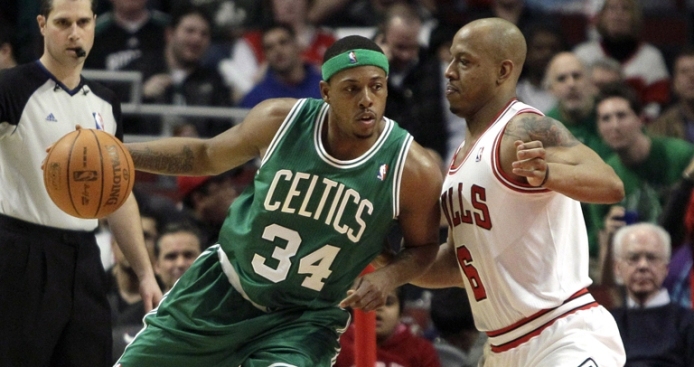 Chicago Bulls' Keith Bogans, right, guards Boston Celtics' Paul Pierce during the third quarter. Derrick Rose scored 30 points and the Chicago Bulls closed in on the top seed in the Eastern Conference by beating the Boston Celtics 97-81 on Thursday. The Bulls' 17th win in 19 games put them four games up on Boston and Miami with four to play and eliminated the Heat from getting the No. 1 seed. The Celtics, who play the Heat on Sunday, still have a mathematical shot albeit a remote one. But barring a collapse, Chicago will be the top seed in the East. It's another step for a team that expected big things after a major overhaul, and all the Bulls have done is deliver their best season since Michael Jordan and Scottie Pippen made championship celebrations a regular event. Rose was a one-man highlight reel against Rajon Rondo, beating him with his crossover and getting to the rim, particularly in the early going. Rose scored 16 points in the first half as the Bulls jumped out to a 48-43 lead, and Chicago regrouped after momentarily falling behind in the third. Luol Deng scored 23 points, and Carlos Boozer added 14 points and 12 rebounds. Chicago outscored the Celtics 44-22 in the paint, outrebounded them 44-35 and held Boston to 38.4 percent shooting. Paul Pierce led Boston with 15 points. Kevin Garnett scored all 10 of his points in the second half and Rondo finished with seven. Jeff Green scored 10 and Ray Allen had seven points. The Bulls led 48-43 at the half when Pierce made a jumper and Rondo hit his first two baskets to give Boston a one-point lead, but the Bulls responded by running off 10 straight, a dunk by Deng and floater by Rose making it 58-49 midway through the third. It was 61-58 after Glen Davis hit two free throws with just over three minutes left in the quarter when the Bulls started a 13-2 run that stretched into the fourth quarter. Deng started the spurt with a 3, and he followed a layup by Boozer off a turnover with a steal and layup to make it 68-58 with 1:31 left. Davis hit two free throws for Boston. But Rose made a 3 with 23 seconds left in the quarter, and Boozer added a three-point play 45 seconds into the fourth to boost Chicago's lead to 74-60. Not only were the Bulls facing one of the top teams in the East, they also honored Pippen by unveiling a sculpture of him during a halftime ceremony.